Developer Sarina DuPont from Embarcadero has a blog post up which highlights the new TMapView component that ships in Delphi XE8 Firemonkey. The TMapView component wraps the native Android and IOS components from Google and Apple respectively. On Android you will need to get a Google API key to use with the TMapView component. A demo is provided which utilizes the Spitcast REST API to display surf locations on a map using a custom image. TFDMemTable is used to store the data from the REST API and output the data to the TMapView. The map component supports lots of the native functionality like normal, satelite, hybrid, and terrain (on Android) map tiles. Additionally you can place custom markers on the map which is what the demo showcases. For full multi platform support on Android, IOS, Windows, and OSX you’ll need to utilize a third party map component like TMS WebOSMaps for FireMonkey or TWebBrowser with IFDEF statements. For offline mapping capabilities you should check out TECNativeMap which can load map tiles from file. These map components should also work in Appmethod and C++Builder. 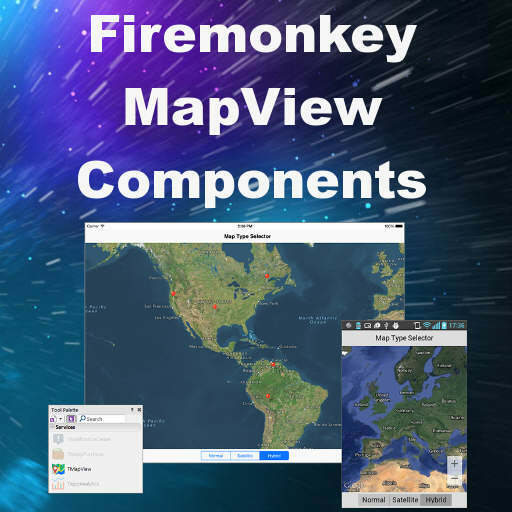 Head over and check out the full blog post about the new TMapView component in Delphi XE8 Firemonkey.